Nothing sums up Stockholm in the winter months than the word ice. As temperatures plummet, sheets of ice start covering the waterways, icicles form on the guttering and pavements turn into treacherous rinks. 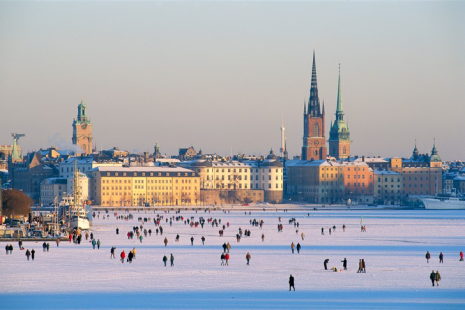 There are few places in the world that are as beautiful as Stockholm in the winter and the city is well worth a visit December to March. Imagine this – a crisp blue winter sky and a hazy cool sun hanging low. The trees twinkling with the fresh white of snow and the city’s orange and red buildings glistening with ice and smoky plumes of steam. It’s really a sight to behold. It’s so achingly beautiful you almost forget it’s minus 20 degrees and your nose turned to an ice cube long ago. Stockholmers really know how to make the most of the unfavourable climate. In Kungsträdgården, an outdoor ice rink is built and you can skate around listening to music and enjoying the afternoon sun. If more adventurous skating is your cup of tea then open water skating is made possible on the many frozen lakes outside of town. On these frozen lakes, you can also go pimple fishing. This entails drilling a hole through the ice, dropping the line into the water and sitting on a stool waiting for a passing fish to bite. What might seem to some like savage amusement is actually a very meditative way to spend a few hours. A morning walk on the frozen Mälaren is another popular pastime. Wrapped warmly in think coats, woollen hats and scarves, Stockholmers walk on the water and finish with brunch or a cup of hot chocolate at a nearby restaurant. Outside of the city, in the forests, tracks are made for cross-country skiing, and even parks such as Tantolunden and Gärdet plough shorter tracks for the urbanites to practice on. As the ice descends on the city, a sense of cosiness develops. In Stockholm’s Old Town, the narrowed cobbled streets seem to be transformed back into previous centuries. There’s nothing more romantic on a winter’s evening than to stroll here, chunky snow flakes pouring down from the sky, the crunch of the ice and snow underfoot. Stockholm’s smart embracing of ice has even manifested in an Ice Bar, located in the Nordic Sea Hotel. Indoors, wrapped in thermal clothes, you can partake of a vodka drink out of a glass made of ice. This place is an offshoot from the Ice Hotel in the arctic north of Sweden, which is well worth a visit. It would be an error of judgement to think Stockholm is only a summer city. There is a great deal to do even in the frozen months.